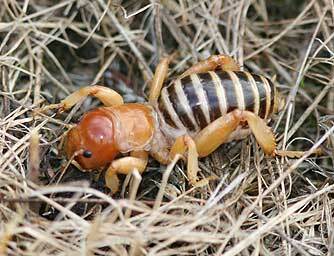 Potato Bug - What's that Bug? 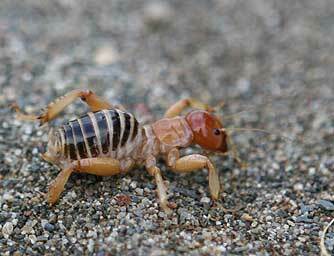 Jerusalem crickets or sand crickets were once thought rare because people don't see them often-- but they're actually common, just hidden most of the time. They live underground, digging around and eating plant roots and whatever other living or dead things they find. They may come to the surface and move about at night, or during the day in cold, wet weather. These crickets are not agricultural pests, do not sting and are not venomous, though they can give a good bite if handled. They will eat meat if they can find it, including other bugs dead or alive-- and the female is even known to devour the male alive after mating, thus nourishing the offspring of both and giving real meaning to the term, "you are what you eat." 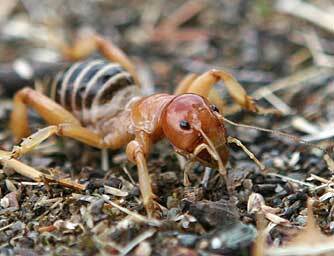 Long-horned crickets such as Jerusalem crickets may be parasitized by larvae of the very large green cricket hunter wasp, and they are regularly eaten by pallid bats, which hunt them on the ground.